At first glance the Via Duca d’Aosta looks like any normal road along the Italian coast. It sits off the Via Aurelia, the main road that hugs the coastline all the way to France which hums and buzzes with Italian traffic. A few vehicles turn off now and then to take the smaller road named after a Duke who was once Italian royalty. Rusty vans wheeze up the road ferrying supplies for the numerous greenhouses that cover the hillside, growing flowers for export. Only the Via Duca d’Aosta is no ordinary road, it is the Poggio, the final climb of Milan-Sanremo. The Poggio was added to the route of Milan-Sanremo in 1960 as a way of livening up the finish but also to thwart foreigners, for Flemish sprinters were winning the race in the 1950s, crushing local hopes. In recent years more climbs have been added, for example La Manie in 2008. The Poggio was the first addition to the route and remains the last climb before Sanremo. Towns and villages are hard to distinguish, urbanisation means the coastal road is a long string of buildings. But you can tell the Poggio is near because as you leave the village of Taggia – or is it Bussana? – there’s a lighthouse above to the right. Normally it warns shipping along the coast but for the cyclists it’s the visual cue that the Poggio is coming. 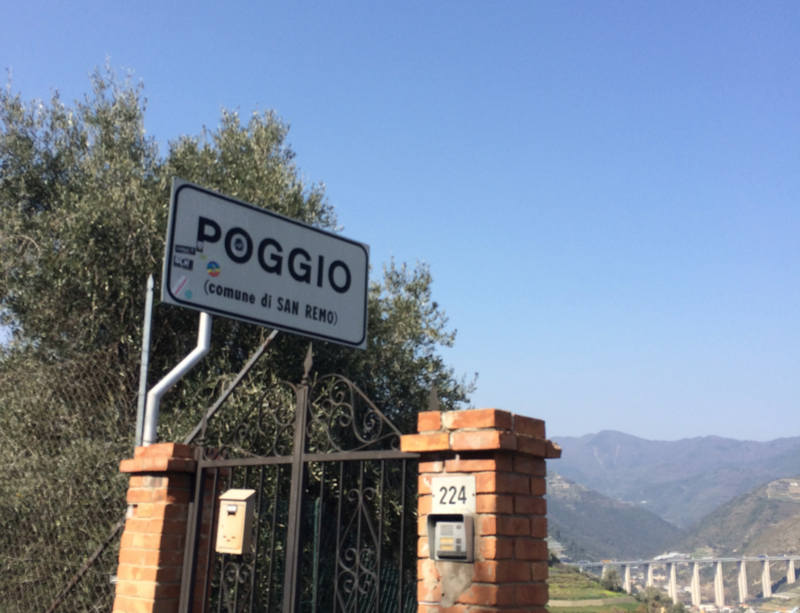 Poggio is Italian for “hill” but it’s not a label given by the race organisers, instead it’s the name of the village at the top. Not very original but it does communicate how the land rises up from the coast, a balcony above Sanremo. 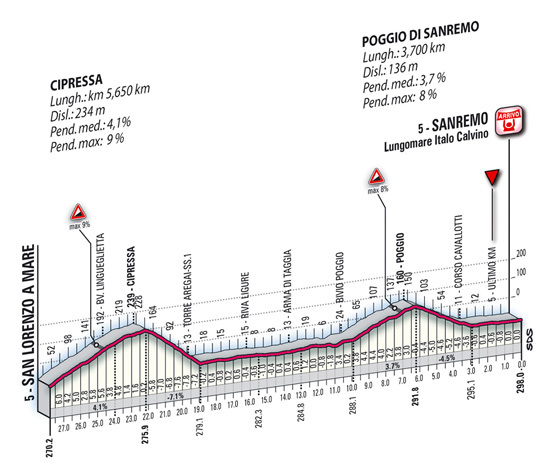 Unlike Le Manie and the Cipressa, there’s no sharp turn for the start of the Poggio climb. Instead the road splits off to the right with a ramp parallel to the main road meaning riders hit the climb at full speed, no braking or cornering needed. The climb is very fast and well surfaced. Less than a minute into the climb and there’s a series of hairpin bends. These are the hardest part of the climb… not for the gradient as they are near flat but for the stress. They are tight and the road is so fast. Brake or take the wrong line and you lose momentum. A mistake here can cost precious places. A mix of grand villas and plain single-storey dwellings line the route along with ramshackle hothouses with numerous broken panes, the flower industry has seen better days. It’s hard not to ride fast here but on a slower day you can wonder what it must be like to live in these houses, to start every ride with a view of the sea, to finish every ride with a climb up the Poggio. If the first two kilometres are the steepest the gradient never rises above 5%. This is big ring territory and the gear choice isn’t just for the slope but for the corners, these are so vital that you need to be able to sprint out of them. The right wheel matters too as drafting the rider in front makes all the difference at 40km/h. This first section is where the attacks often happen because the slope and the bends mean a strong rider can put time into his rivals. Or try. Graffiti from the race lines the road, Paolo Fornaciari’s name still lives on in white paint despite his retirement in 2008, he runs an ice cream parlour now. After two kilometres there is a chapel on the left and a restaurant on the right, each offering rest of different sorts but there’s no time for cyclists to ease off as here the road levels off and straightens out for a moment. If a sprinter is with the leaders here, there’s a good chance they can hitch a ride to the top. It keeps climbing but now at 2-3% with one short 8% ramp in the middle, ten pedal strokes and it’s over but this is often the launch pad for big attacks. Again being on a good wheel is crucial. This isn’t a climber’s climb at all. Instead it’s for puncheurs trying to land a knock-out blow on everyone else. If two riders faced the Poggio together it would be a good place to attack but for a group anyone who accelerates here has to feel very confident… or realise they have no chance in the sprint so they might as well grab some glory and TV airtime. As soon as the riders pass the top the descent to San Remo begins. It’s not hard nor technical. But it comes after 290km of racing and one of the world’s biggest bike races is about to be decided. Which makes this a demented descent. Riders have been known to attack on the descent, Sean Kelly famously reeled in Moreno Argentin, see the clip above from 2:00 onwards. Similarly in his book “Merckx: Half Man Half Bike” William Fotheringham recounts how Eddy Merckx came over the top with just ten metres’ lead on his rivals but pushed this to 30 seconds by the bottom and it wasn’t down to just reckless descending. The writer explains Merckx was so powerful he was able to sprint out of every corner and pull away from the others with their dead legs. Line matters. There are sharp 90° corners and several hairpins. Above all the road has various imperfections. A few sunken inspection covers, some ripples in the tarmac and other minor obstacles. The previous climb of the Cipressa has a longer and more technical descent. Again the Poggio is not a problem on a normal day but with riders giving everything to speed to the finish, a wrong corner or hitting a hole in the road equates a loss of speed, a waste of energy or worse. The descent finishes as the climb started, with a ramp back onto the Via Aurelia. From here it is straight on to the finish line on a wide flat road for 3km. Technical details: 3.7km at 3.7% with a smooth road surface. Summary: an ordinary road with a modest gradient, you could ride up here on a normal day for the view or on your way to the Passo Ghimbegna. By itself it’s just a busy little road with some houses and covered in ramshackle plots for flower growing. Everything changes when it appears on the route of Milan-Sanremo after 288km. The longest race on the calendar, the distance ensures even a small climb has the potential to change the outcome of a race. Even if the Poggio is not hard enough, it will still have done damage to many legs on the way up and to nerves on the way down. An ordinary road for 364 days of the year, the Via Duca d’Aosta is the last strategic point of Milan-Sanremo. Nothing to do with the Poggio, but where is that fountain where there is always a crash from the spray on the pavement? That’ll be Imperia with the fountain in the middle of the road. I’ve driven past that fountain the day before the race and many other times…and have yet to see this legendary spray (wetness) on the pavement. I wonder if this happened just once or twice and since has become part of the myth of La Primavera? The fountain in Imperia gets some air time in the documentary that was posted on here yesterday. Nice read, it’s like going back. I used to live in Nice. I rode it and wondered what the fuss was about. It’s a boring road and the village at the top is plain. If it wasn’t for the race nobody would use it. But I kept riding it. It was in the days before Strava but I’d always time myself to test my form. For me it always went on for too long. You get to the chapel/park on the left and think you’re up on the ridge but it goes on and on. I was there for the finish last year…check out the descent of the Poggio, could be a different story in the rain tomorrow!Cheers. A note to say I’ve had to retype some comments in here after problems with the website overnight. The server that runs this site has been having too many problems and I’m changing the hosting company. As part of this some comments overnight were lost. Sorry but hopefully it means this website is now faster and more reliable.